Today’s Herald Digipoll is not good news for Labour, coming off the back of last week’s positive Roy Morgan poll which showed a centre-left majority. As the Herald notes, on the basis of this poll National has enough support to govern alone. But what it also demonstrates is the mistake National has made in devouring its potential coalition partners (ACT and UF score a pitiful 0.2% each). MMP doesn’t look too fondly on parties gaining a majority by themselves, and as the election nears and National’s vote inevitably drops down to the mid-40s the numbers game will start to look very different. Labour’s vote has actually held up pretty well, and at just 0.8% less than the last Digipoll it’s well within the margin of error. Still, they’d be feeling a lot more comfortable in the early-40s, especially with the Greens a little closer to the 5% mark than they’d like. In a strange twist that would appear to cast some doubt on the poll’s accuracy, Helen Clark has increased her lead over John Key in the preferred Prime Minister stakes, leading him 50.8% to 37.3%. This is odd because preferred PM generally tracks pretty well with the party’s fortunes. 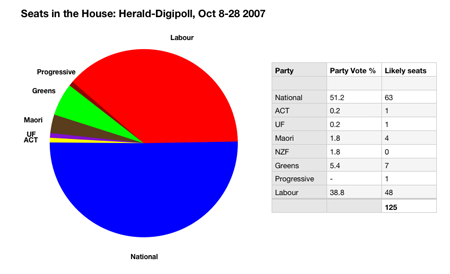 Also of interest is the projected size of the Parliament, with ACT, United Future and Progressive’s low polling adding to the Maori Party’s usual overhang to stretch the house to 125 seats. Overall, it’s 65 seats to the centre-right (Nat, ACT, UF) and 60 to the centre-left (Lab, Grn, Prog, Maori). Even on a bad day, there’s still not much in it. Glad youse didn’t ignore this poll just because its not great news. It must be tempting just to be the sunshione gang for the left like Farrar is for the right but that’s the way of a hollow man. – and there was no major events to move that number of people to National, plus you have this strange result with Clark up, Key down and their parties going opposite… its wait and see time I guess. The graph really does show how close it is in a way you’d never get from the media’s FPP-style coverage. 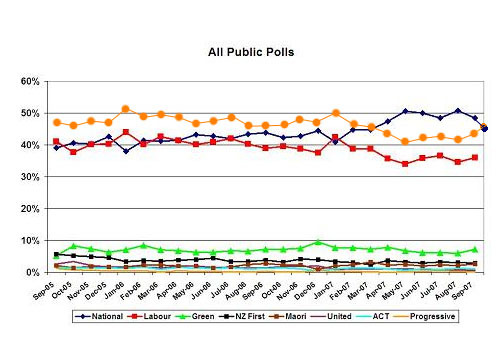 It really does show how high National’s vote has to be to win government – I’d say 47% plus to be in with a chance. And as you say, that’s just not very likely. Poll after poll shows the right has a small base that’s augmented with swing votes. I suspect this is a bit of a rogue one but even here we see that Labour’s solid base is the largest. I’d be interested to see a poll that was based on policy rather than party but I guess when one of the two major parties doesn’t have any policy that might be a bit one sided. Even if National do get in their tenure will be limited. New Zealanders hate privatization. 1 The John Key attack site. 2 The John Key attack site with a few other posts. 3 Labour supporting blog with some attacks and interesting links. 4 The left wing site that can acknowledge bad news. 5 The left wing site that can criticse it’s parliamentary wing. 6 The left wing site that can laugh at itself from time to time. 7 The left wing site that provides a forum to improve policy. So you are up to (4), by my ‘ladder’. That’s pretty quick progress. Especially as it takes time to find a voice. Good job. But you really need to get a verification test that doesn’t look like a google ad. And I’m sure there’s a 7 or two in there somewhere, but hey it’s after 5 o’clock and I’d rather be drinking beer. Milo, you are wise and full of chocolatey goodness! The Standard can set the standard for constructive online debate. Onwards! I quite like that poll, it suggestes that NZ is over socialism. I quite like Key’s flip-flops, it suggestes that National now embraces socialism. I quite like the result of the last 3 elections, it suggestes that NZ likes socialism. I quite like the fact that tories now accept all the policies they used to bemoan, it suggestes they are nothing more than fearmongering handbrakes on history. I quite like Trent’s comments, it suggestes that tory apologists are moronic prats. Time to acknowledge that Key has not lost his Mojo? I think the most important fact in analyzing all polls for a number of years is The “Hard” vote fot the left Green Labour is 45%. Though nothing is guaranteed, a base of 45% is a very good start for any election. Which is approx 100 000 votes. I think it should be renamed Herald Dodgypoll. No ak, it suggests that my theory that socialists have had their day, is correct. Only brain damage gives reasonable cause for voting for more of the same.